This is a review for the Healthy Hair Energizer Vitamin. The manufacturer of this product claims this hair supplement will help consumers combat hair loss. They claim it will give the results of stronger, healthier hair that is both shiny and thick. Keep reading to see if this the right daily hair supplement for you and your health needs. The manufacturer states that it has 9 other vitamins in this supplement, though the specific information has not been listed. It also states that it has a “17 amino acid complex.” The tablets are vegetable based. The recommended dosage for this supplement is 2 tablets. The manufacturer suggests the consumer take one in the morning and one in the evening, both should be accompanied with a meal. They also suggest consumers intake plenty of fluids in between dosages. The manufacturer claims that this product will not produce any side effects. This product retails for $19.95 but is currently listed for $13.90. For the price, you get a 30 day supply which equates to 60 tablets. The company does provide the consumer the option of a monthly plan once the product is finished after 30 days. The monthly plan also saves the consumer 20 percent. Which is ideal for consumers who enjoy the product. It is also a nice touch for those who are loyal to the product as well. The manufacturer does have a 45 day money back guarantee. If the consumer is not happy with the product, they can ship the item back with 45 days from purchase in order to get a full refund. This can give the consumer enough time to see if they are satisfied with the results they are getting. The manufacturer also has positive reviews, though it should be stated that they do give consumers incentive to leave a review with a $10 coupon for select products. In the description of the money back guarantee, the manufacturer states there have been over 10,000 satisfied consumers, however the number of reviews for this supplement is nowhere near that. 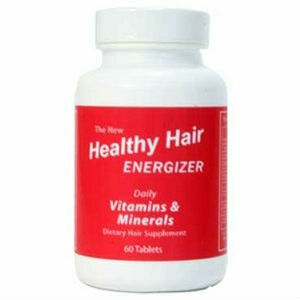 Healthy Hair Energizer Vitamin is reasonably priced and the manufacturer does provide decent discounts for the item. The company does provide a 45 day money back guarantee in order to uphold consumer satisfaction along with a monthly subscription plan. While they do list the main ingredients of the product, they do not provide all the vitamins and minerals, which can leave consumers unsure as to whether or not this item is right for them. The lack of the additional ingredients is something which can cause alarm for some consumers, however; the manufacturer is very specific as to what this supplement does for hair growth. Consumer reviews have generally been positive, however; the incentive of the coupon should be something to consider. John Brownstone	reviewed Healthy Hair Energizer Vitamin	on July 28th	 and gave it a rating of 3.5.